Supported by National Natural Science Foundation of China (81460426, 81803007) and Appropriate Technology Development and Application Project of Guangxi Zhuang Autonomous Region Health and Family Planning Commission (s201629). Abstract: Objective To explore the predictive value of preoperative aspartate aminotransferase-to-platelet ratio index (APRI) for post-hepatectomy liver failure (PHLF) after hepatectomy in the patients with primary liver cancer (PLC). Methods A retrospective study was conducted on the data from the PLC patients who underwent first hepatectomy in Tumor Hospital Affiliated to Guangxi Medical University between Sep. 2013 and Dec. 2016. 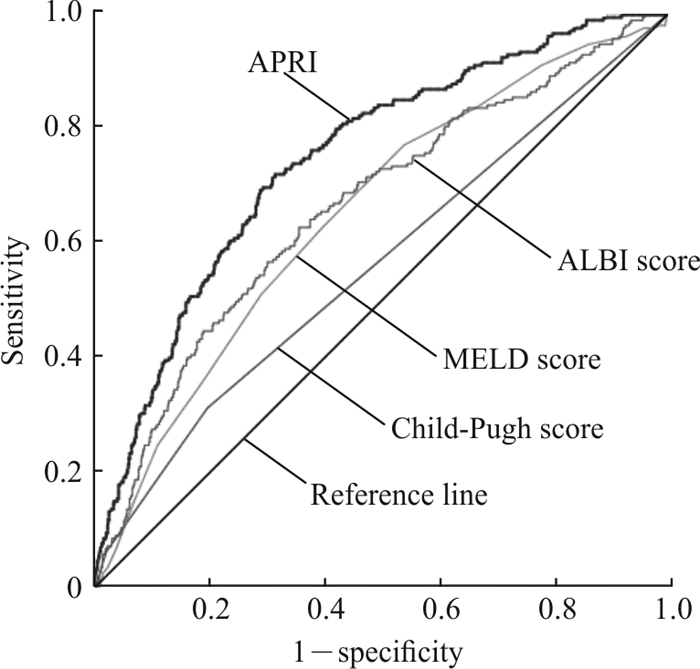 The logistic regression model and receiver operating characteristic (ROC) curve were performed to determine the predicting values of APRI, Child-Pugh score, model for end-stage liver disease (MELD) score and albumin-bilirubin (ALBI) score for PHLF. Results A total of 1 108 PLC patients were included in this study, and PHLF occurred in 217 (19.58%) patients. The logistic regression analysis showed that Child-Pugh score, MELD score, ALBI score and APRI were predicting factors for PHLF (all P < 0.05). The ROC curve analysis showed that preoperative APRI (area under curve[AUC]:0.745, 95% confidence interval[CI] 0.709-0.781, P < 0.001) was significantly better for predicting PHLF compared with Child-Pugh score (AUC 0.561, 95% CI 0.516-0.605, P=0.005), MELD score (AUC 0.650, 95% CI 0.610-0.691, P < 0.001) and ALBI score (AUC 0.662, 95% CI 0.621-0.703, P < 0.001). Based on Youden index, the best cut-off value of preoperative APRI was 0.55 for predicting PHLF in PLC patients, with a sensitivity of 71.9% and a specificity of 68.5%, and the patients with APRI>0.55 had significantly higher overall incidence of PHLF, and higher incidence of PHLF A, B and C compared with ones with APRI ≤ 0.55 (all P < 0.05). Conclusion Preoperative APRI is more accurate for predicting PHLF after hepatectomy in PLC patients versus the Child-Pugh, MELD and ALBI scores, providing guiding significance for clinical treatment of PLC. SHIHA G, IBRAHIM A, HELMY A, SARIN S K, OMATA M, KUMAR A, et al. Asian-Pacific Association for the Study of the Liver (APASL) consensus guidelines on invasive and non-invasive assessment of hepatic fibrosis:a 2016 update[J]. Hepatol Int, 2017, 11: 1-30. DURAND F, VALLA D. Assessment of the prognosis of cirrhosis:Child-Pugh versus MELD[J]. J Hepatol, 2005, 42(Suppl 1): S100-S107. WAI C T, GREENSON J K, FONTANA R J, KALBFLEISCH J D, MARRERO J A, CONJEEVARAM H S, et al. A simple noninvasive index can predict both significant fibrosis and cirrhosis in patients with chronic hepatitis C[J]. Hepatology, 2003, 38: 518-526. CHENG J, ZHAO P, LIU J, LIU X, WU X. Preoperative aspartate aminotransferase-to-platelet ratio index (APRI) is a predictor on postoperative outcomes of hepatocellular carcinoma[J/OL]. Medicine (Baltimore), 2016, 95: e5486. doi: 10.1097/MD.0000000000005486. DIENSTAG J L. The role of liver biopsy in chronic hepatitis C[J]. Hepatology, 2002, 36(5 Suppl 1): S152-S160. 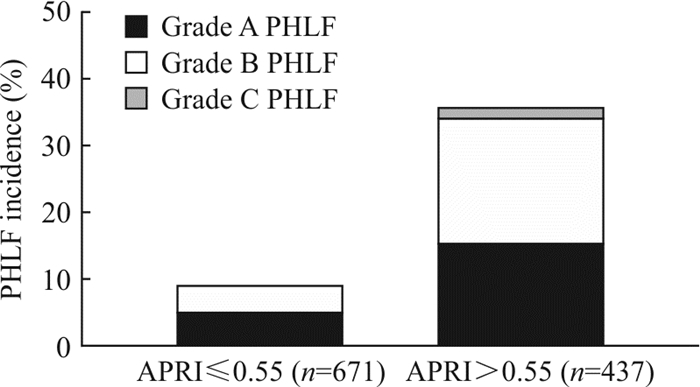 LOAEZA-DEL-CASTILLO A, PAZ-PINEDA F, OVIEDO-CÁRDENAS E, SÁNCHEZ-AVILA F, VARGAS-VORÁCKOVÁ F. AST to platelet ratio index (APRI) for the noninvasive evaluation of liver fibrosis[J]. Ann Hepatol, 2008, 7: 350-357.